A startup is using microwave technology in an innovative conversion process that allows for small units that can be sold to large plastics generators and other stakeholders. California-based Resynergi is developing the technology into a modular product, breaking away from the traditional plastics-to-fuel model of operating a large conversion plant. The company is looking to sell its microwave system to a range of buyers, such as big box stores and manufacturers. Resynergi’s product can be customized based on how much capacity a customer needs. For a unit that can process a ton of material a day, the company plans to charge about $300,000 to $350,000. For system with a 2 ton daily capacity, the cost would be twice that. The aim is to release the product late this year. The company launched about a year ago and has been working to develop a different approach to providing the heat source necessary for plastics-to-fuel conversion. The company’s Evolucient CMAP (Continuous Microwave Assisted Pyrolysis) 1 Continuous Pyrolysis System accepts PP and PE streams that currently are not often mechanically recycled. The materials enter the system as solid plastics and go through an extrusion process. At that point, the technology deviates from normal plastics-to-fuel processes, said Tanne, who co-founded the company along with Brian Bauer. “Most companies use more traditional heating methodologies, whether they’re radiated heat through gas or some kind of heater system, to take materials from a solid state into a liquid and then into a gas,” Tanne said. Instead, Resynergi’s system fires microwaves into a reactor vessel, which begins breaking up the carbon chains in the plastics “almost instantaneously,” Tanne said. That’s because microwave energy can create volumetric heat, evenly heating the materials and increasing temperatures faster than indirect heating methods. As the material changes state, its carbon chains are broken down, and are either condensed into fuel or can be used for energy production in a generator system. The system’s output is about 80 percent diesel and 20 percent other materials – lighter elements like naphtha, with some heavier oil mixed in as well. The diesel output is essentially an ASTM-grade diesel or diesel equivalent product, generally sulfur-free, with a fairly high cetane level, Tanne said. However, it differs from a refinery product in that the fuel would have no preservatives, which are added during commercial refining. “The goal is you’d be able to put it in a diesel engine without any issue,” Tanne said. The system yields about 90 percent of the weight of PP and PE that’s fed into it. The ratio for plastic converted to fuel through the Resynergi system is about 1000 liters per ton of feedstock. The microwave method means the whole system can take place in a smaller physical vessel. “It’s a piece of equipment in a small frame. It’ll fit on an 18-foot trailer if you want,” he said. The equipment is powered entirely by electricity, and because the microwave energy generates heat internally without having to heat through the vessel walls, energy costs are fairly low, Tanne said. He estimated the system uses about half a kilowatt of energy to take one kilogram of plastic and convert it into roughly one liter of fuel. Assuming the output fuel generates about 3.5 kilowatts of power in a standard diesel generator, Tanne noted the system can sustain itself using about one-sixth of the total power output. Counting the purchase and operating costs, the company estimates a payback period of about a year and a half. That figure assumes a 1- to 5-tons-per-day system module running about 90 percent of the time. 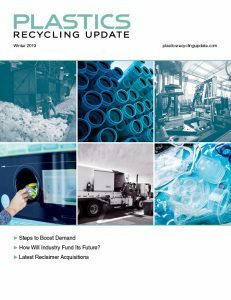 It also assumes the operator is able to charge a tipping fee to other feedstock suppliers – plastics-to-fuel operators often charge less than a landfill tipping fee to accept discarded plastics. The lower costs and energy consumption may make this technology economically viable at a time of low oil prices, which have stymied other sector players. Resynergi, which has California and Washington offices and was recently profiled in the North Bay Business Journal, has received several orders for its product. The company aims to send out pilot systems toward the end of summer. Assuming the tests go well, the 1- and 2-ton per day models would be released late in the year. Under that schedule, the 5-ton capacity versions would follow shortly after.